Full and very great quality! Had it for years now and just love it! Effortlessly enhance the look of your bedroom with the White Gathered Cotton Voile 18-inch-drop Bedskirt. This bedskirt features a cotton construction in white with a polyester liner and a gathered design. Thanks to reviews I read before I ordered I didn't expect this to look exactly like the promotion photo. I expected to iron it, but not spend an hour like another reviewer. I spent about 45 - 50 minutes ironing. I also expected it to be less gathered than the photo, as advised, and found that true. I also expected the fabric to not be as nice as it appears in the photo, and that was the case. I didn't know it had a liner, which I'm glad it had because without one, my white bedskirt would have been too sheer. As it is, it is still a little too sheer for my taste, making the skirt appear grey due to the dark shadows under the bed. The 18" drop actually measured 18 1/2 inches so the skirt drags a little on my carpet. Because the ruffle appears to be a thin cotton, and I would like more of a sheen, I may later add another layer outside of the ruffles, and shorten the existing skirt slightly, making this skirt the liner. Overall, this bedskirt is a quick, easy, nice addition, although not a high end skirt, that I can work with to get the exact results I want. So lovely, so I bought 2! One 15’ drop, King size for the Master bedroom and one 18’ drop for the guest room. It is wrinkled but that is part of the look. If you want a formal look this is not for you but if you like Shabby Chic, Farmhouse or just casual then this is the one. The base is not that wimpy webbing that falls apart but I nice fabric base. Great price too. The picture gives a softer appearance--the fabric is stiffer. However it is nicely made, with plenty of material to create a full skirt. I like this cotton voile bedskirt with a liner. It is not at all cheap. I love the length and how it drapes on the floor just a little. It's exactly what I was hoping for. 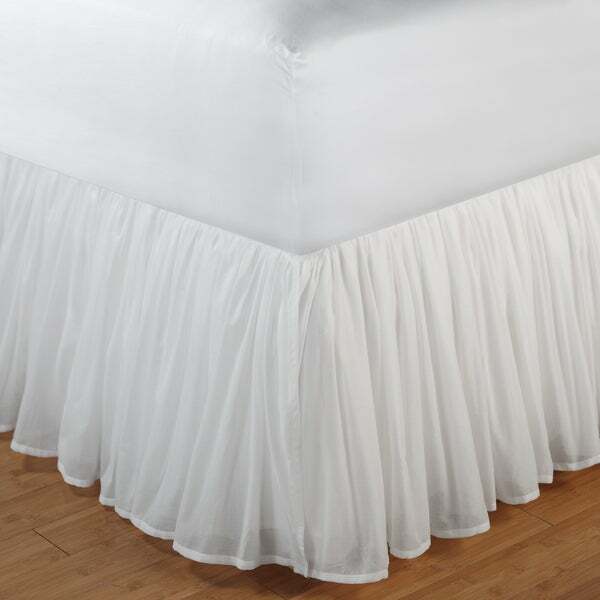 This is a high quality bedskirt with a cotton underlayment and sheer overskirt. Looks beautiful on the bed. This is the second one I have bought. Has plenty of gathers so it doesn't look skimpy and it has a liner so it looks white from top to bottom. Absolutely makes the bed. Very nice, as pictured on line. Love the soft look of the Cotton Voile fabric. Makes the perfect touch to dressing up the bed. Yes I would recommend . This skirt is exactly what I wanted; a feminine lush white skirt to go with a comforter that I have. No need to iron it...just toss in the dryer for a few minutes &amp; put on the bed. I like the crinkled look of the voile. This voile adds a feminine but country/rustic look in our mountain cabin with the iron bed it's on. The neutral white will go with whatever bedding I use for it. It was very wrinkled so I used a hand steamer on it after placing it on the bed. I love this bed skirt. I have now purchased for 4 beds. They are great quality and really like the rounded corners that hold the skirt in a place. This bedskirt is more beautiful than it appears in picture. Spectacular on my bed. "Is this machine dryable? The details only say machine washable." I have never machine dried this bedskirt. Air dry and iron. "Does this bedskirt have split corners?" Yes it does. I love this bedskirt. I haven't opened it yet. We are moving in about 2 weeks. "Is this a wrap around?" The measurements are 39x75+18 (drop). Yes it covers three sides ! "Is the platform cotton or polyester? I've found polyester platforms to rip easily when putting on the bed. Anyone have this issue?" The platform is polyester. It seems strong enough to me. The platform is polyester, and although I have had no trouble with tearing, it is quite slippery. "This photo shows a stitched seam on the corner top to bottom. Although not stated, but pictured... this skirt has split corners, correct?" "I have a bed which is 140 cm X 190 cm (french dimensions) do you have these dimensions? Thank you"
That would be a standard full size. You would choose the full size option from the drop down tab. "Do you have it in a Calif King?" The bedskirt is not available in California King.